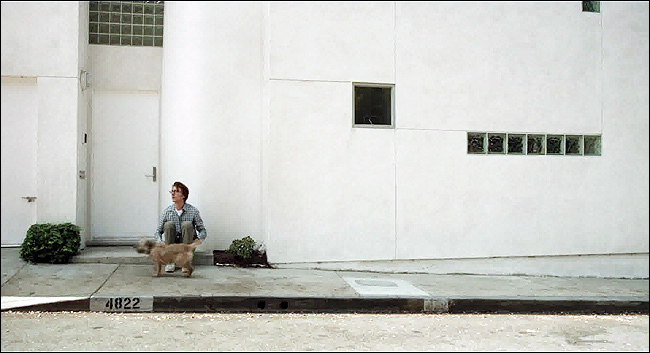 "Ruby Sparks" was filmed entirely in Los Angeles, most of it in the Los Feliz and Hollywood areas. located in the hills above Los Feliz Blvd, below Griffith Park, at 4822 Glencairn Road, Los Angeles. been filmed at the narrow swimming pool in the back of this same Los Feliz house. Here is a matching Google StreetView of the house. 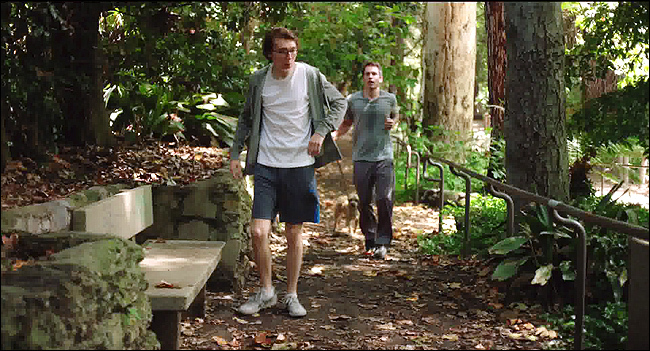 'Calvin' first meets 'Ruby' (Zoe Kazan) in Griffith Park, where he walks his dog. 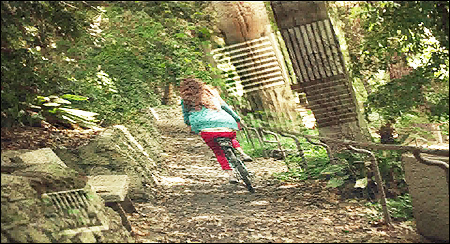 she is riding a bicycle. 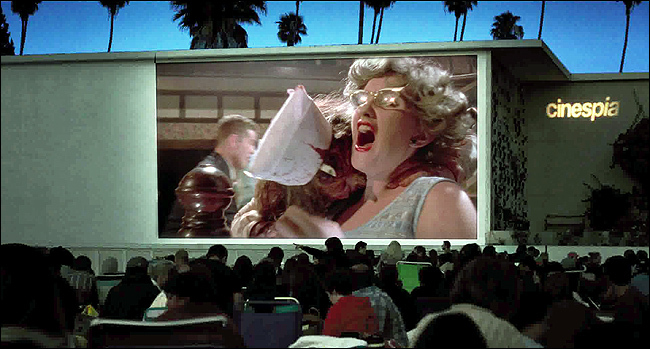 That scene was shot in the Ferndell section of Griffith Park. out jogging and walking his dog. small bridges, trickling waterfalls, stone planters, and towering redwood and maple trees. & Ferndell Drive, behind a wrought-iron gate. Here is a Google StreetView of the entrance to the Ferndell trail. Calvin finds out that Ruby is real during a date with a book groupie at a sidewalk café. to discover that everyone can see Ruby. 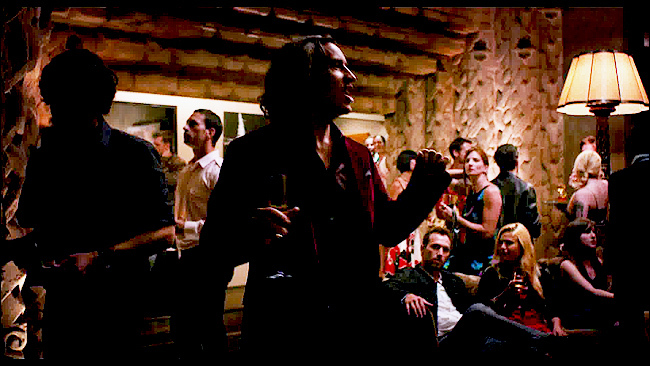 This scene was shot at the Figaro Café, at 1802 N. Vermont Ave, in the Los Feliz district. That's on the east side of Vermont, between Franklin & Prospect. Here is a Google StreetView of the restaurant. And here's a rare Google inside view - feel free to move around. the final resting place of many stars, from Rudolph Valentino to Douglas Fairbanks. And yes, they really do hold outdoor movie screenings at the cemetery. the side of the mausoleum where Valentino is buried. the Hollywood Hills, at 7710 Woodrow Wilson Drive, Los Angeles. The wacky roof slide and treehouse seem to be real (take a look at the aerial photos). in the '70s & '80s, including "H.R. Pufnstuf", "Lidsville" and "Land of the Lost"
he finds that she is now ridiculously clingy, paranoid and dependent. other side of the street, semi-hysterical because he let go of her hand. That intersection is none other than Hollywood & Highland, the new center of Hollywood. Highland Ave from the southeast corner of that intersection to the southwest corner. Here is a Google StreetView panorama of the intersection. none other than the historic Egyptian Theatre, at 6712 Hollywood Blvd, in Hollywood. Here is a Bing StreetSide view of the theatre. eccentric creation of famed architect Frank Lloyd Wright. It resembles a Mayan temple. The house is located at 5121 Franklin Avenue, in the Los Feliz district. Here's a Google StreetView for the location. to an appreciative audience. There appears to be a tree growing in the middle of the bookstore. 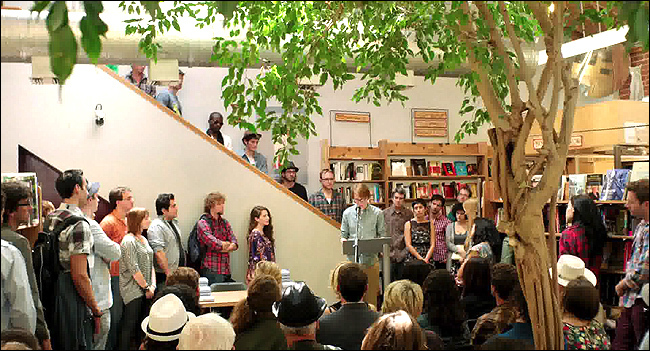 This scene was filmed inside Skylight Books, at 1818 N. Vermont Ave, in Los Feliz. Here's a Google StreetView of the shop. The arcade where they play: Family Amusement Corp, at 876 N. Vermont Ave. The restaurant where Calvin and his brother talk: El Coyote Restaurant, at 7312 Beverly Blvd. The golf course where Calvin & his brother play golf: Harding Golf Course, at 4730 Crystal Springs Drive. The traffic jam: created in the Los Angeles Zoo parking lot, at 5333 Zoo Drive, in Griffith Park. 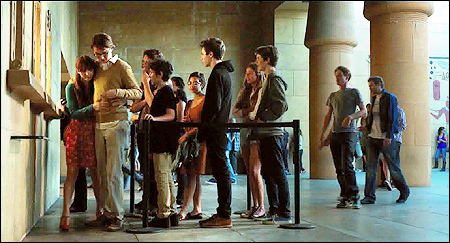 Calvin's Q&A Session: inside a theater at the Hammer Museum, at 10899 Wilshire Blvd. 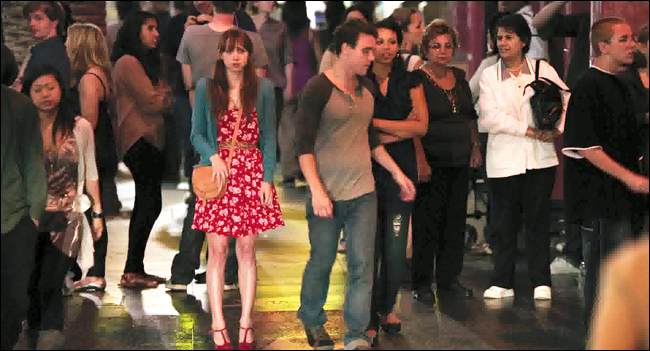 The photos on this page are stills from "Ruby Sparks"
(which you can buy by clicking here) and are copyright Paramount.